If you have never won a prize, this might be your lucky day! Just in time for the Holidays, Mars Chocolate is giving away thousands of chocolate and cash prizes in the Get Charged For The Holidays Game! Yes, thousands of prizes!!! In fact, Mars will be awarding over 45,000 pre-paid debit cards and exactly 100,000 free Mars Chocolate Singles Bars! That’s $464,000 worth of prizes and you could win instantly! Amazing, isn’t it? Are you ready to get charged? There are two (2) ways to play the Mars Get Charged For The Holidays Game. Either send a text message containing the keyword “CHARGED” to 87654 or play online at getcharged.mars.com. If you enter via text message, you’ll be required to send at least three (3) text messages and follow the instructions to complete your game play. If you are participate online, you’ll be required to register prior to playing the game. 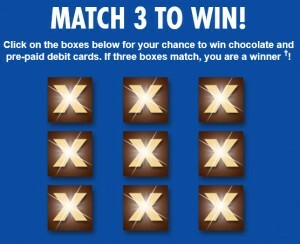 Then, you’ll be invited to match three (3) boxes by clicking on the images displayed onscreen to find out if you’re an instant winner. Please note that if you win by playing via text message, you must claim your prize online by entering your Winner Code at getcharged.mars.com/redemption by 11:59:59 PM ET on February 1, 2016. You are eligible to play the Mars Get Charged For The Holidays Game only if you are a legal resident of any of the fifty (50) United States or the District of Columbia. You must be thirteen (13) years of age or older as of date of participation to win. Return daily through 11:59:59 AM ET on December 31, 2015 for additional chances to win. Good luck! The Big Night In Game at FamilyFun.Mars.com: Over $4,000,000 in Family Fun Prizes!